Warner Music Group and the independent sector were the big winners in terms of global market share last year. That’s according to the latest annual figures from Music & Copyright / Ovum, which are based on revenues across both recorded music and publishing. 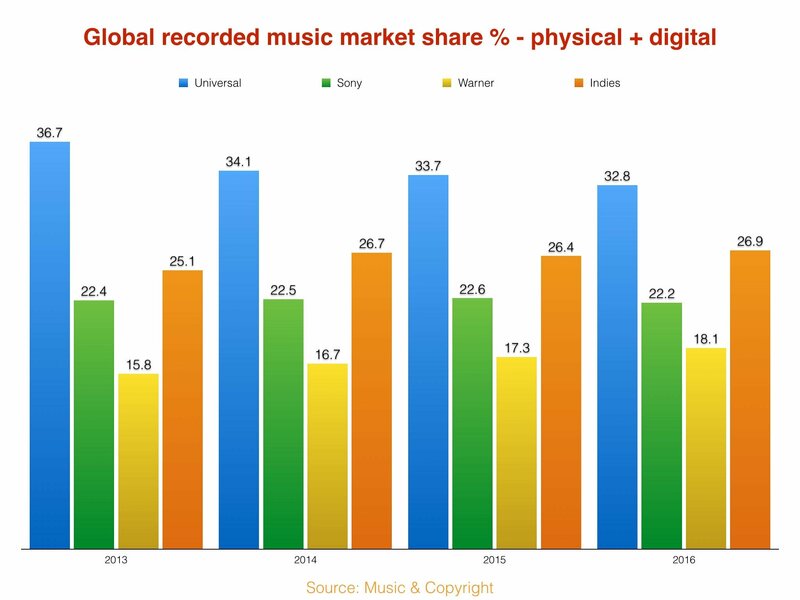 In terms of overall global recorded music performance (inclusive of physical + digital) in 2016, M&C’s data gives Universal the lion’s share with a 32.8% market share – but this was down 0.9% year-on-year. Sony also lost share, by 0.4% on 2015’s numbers. The two big gainers were Warner (+0.8%) and the independent sector (+0.5%). Thanks to artists like Radiohead (pictured), the independents controlled the second biggest market share of all entities with 26.9%, while Warner took a share of 18.1%. 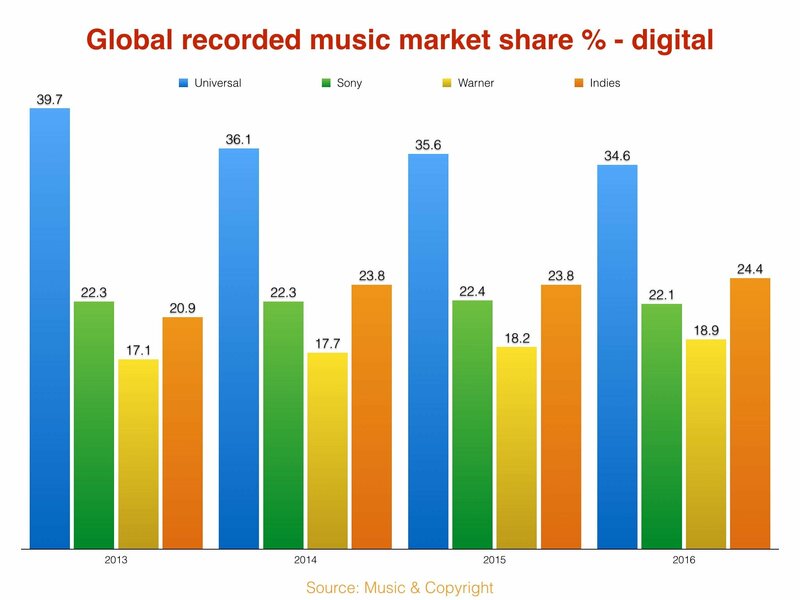 Universal, suggests the numbers, has lost 3.9% recorded music market share since 2013. Looking specifically at digital revenues, Music & Copyright again has Universal as the No.1 performer in 2016 with 34.6%. However, this was down a full percentage point on 2015. Sony lost 0.3% share on digital in the year, down to 22.1%. Warner was once again the biggest gainer, growing 0.7% to 18.9% as the independents grew 0.6% to 24.4%. In digital terms, Universal has dropped 3.1% in market share share since 2013. (In the physical-only market in 2016, it was a similar pattern, with both UMG and Sony down. Warner was up 0.7% to 17% and the indies saw gains of 0.5% to 26.9%). Music & Copyright also estimate the global music publishing shares. Again based on revenue, the figures have been revised for 2015/2016, as you can see below. 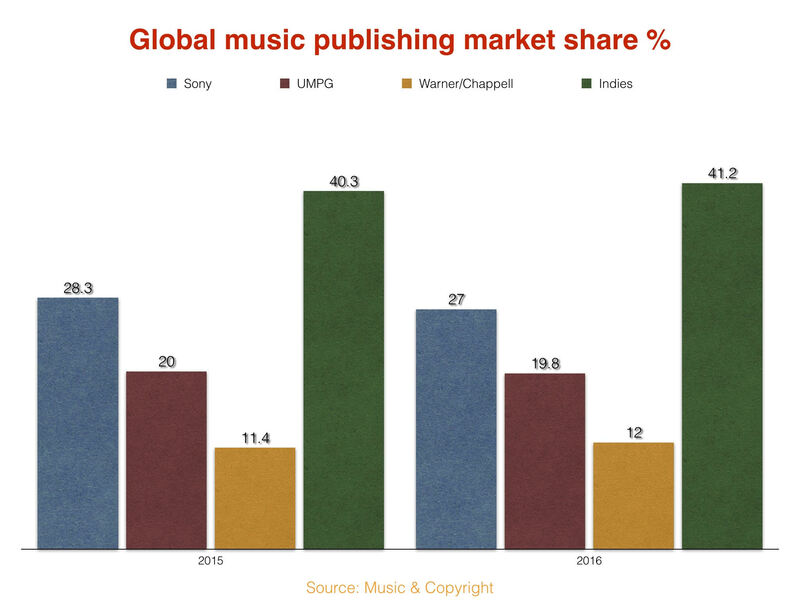 One thing to note: Sony’s share here includes Sony/ATV, Sony Music Publishing Japan and the major’s share of EMI Music Publishing. Interestingly, the clear leader here is the collective power of the independent sector (which includes the likes of BMG, Kobalt, SONGS, Imagem, peermusic and others). The indies saw their share of the market grow by a very healthy 0.9% in 2016, up to 41.2%. Both Universal Music Publishing Group and Sony saw dips in their share. Warner/Chappell was the only major publisher to see growth, with its share rising 0.6% year-on-year to 12%. 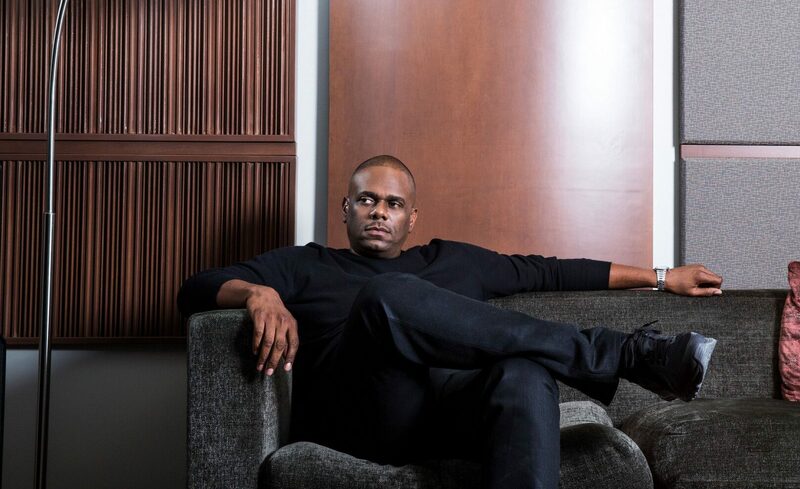 When MBW interviewed Warner/Chappell boss Jon Platt last year, the exec told us: “What defines us is our dedication to our songwriters.